Athletes of various ages and levels of participation explore the use of ergogenic aids. Attempts to enhance athletic performance are not new. The Olympic games date back 2700 years, which means that seeking advantage in sport likely dates back just as far. The winner of the 1920 Olympic 100m dash, Charlie Paddock, drank sherry with raw eggs before the race. In 1960, the Danish cyclist Knut Jensen died during a road race from taking amphetamines (Voy and Deeter, 1991). The use of drugs to enhance performance is not limited to Olympic athletes only. Many adolescent athletes experiment with anabolic steroids. Caffeine is widely used as an ergogenic aid by runners, cyclists and triahtletes and creatine is a popular supplement amongst university strength and power athletes (Eichner, 1997; Sinclair and Geiger, 2000) Considerable literature exists on the topic of ergogenic aids and the athletic performance. It includes studies of the potential performance benefits of alcohol, amphetamines, epinephrine, aspartates, red cell reinfusion, caffeine, steroids, protein, phosphates, oxygen-rich breathing mixtures, gelatin, lecithin, wheat-germ oil, vitamins, sugar, ionized air, music, hypnosis, and even marijuana and cocaine (McCardle, Katch and Katch, 1991). The ever-growing quest among sports participants to perform better and the abundance of ergogenic supplements makes it the responsibility of the scientific community to ensure that the public are well informed. Knowledge is necessary to lead us into the right direction. The prudent approach should not only focus on issues like efficacy, health-related safety of these substances requires urgent research. The industry of ergogenic supplementation has become a massive commercial enterprise. A product manufactured by Nu Science Corporation (A division of Deutrel Industries) is currently on the market for use as ergogenic aids in sport relying on aerobic energy provision. The product is known as CELLFOOD®. The efficacy of this product and its dosage response within the context of improved aerobic performance falls within the scope of this report. Secondly, to determine at which dosage CELLFOOD® tend to be most effective. Counteract the inhibitory affects of the central nervous system on muscular contraction and other functions. Frequently ergogogenic aids are thought of only as pharmacological agents that may be consumed to give the athlete an advantage. Pharmacological agents constitute only one of several classes of ergogenic aids. Others include nutritional (carbohydrates, proteins, vitamins, minerals, water, and electrolytes), physiological (oxygen, blood boosting, conditioning, and recovery procedures), psychological (hypnosis, suggestion, and rehearsal), and mechanical (improved body mechanics, clothing, equipment, and skill training) components. In its broadest sense, one could call anything that can be related to an improvement in work or performance an ergogenic aid. Ergogenic aids affect different people differently, as might be expected. For some, studies show a positive influence on work performance and for others, no affect whatsoever. What might prove effective with the athlete may prove inconsequential to the nonathlete and vice versa. Certain ergogenic aids may influence a person's endurance performance but may have little or no effect on activities requiring short bursts of strength and power (Fox and Bowers, 1993; Williams, 1983). Forty-five marathon runners between the ages of 20-51 years (mean age = 38, 4 ± 8.2 years) volunteered to take part in the study. All of the participants were members of marathon clubs in and around Pretoria. They were all briefed on the nature of the research project and possible risks involved. They were not allowed strenuous training the day before each test. The primary aim of the study was to determine the efficacy of CELLFOOD® as an ergogenic aid for endurance athletes. In order to reach this goal a pre-test - posttest, experimental design, was adopted for the study. Subjects were randomly assigned to one of two groups. Each of these groups underwent an intervention period of four weeks. After each four-week period the subjects stopped taking the supplementation and underwent a two-week wash out period during which they took no supplementation. The dosage taken for the product varied throughout the whole study depending on the cycle in which the product or placebo was taken. The stature was measured with a calibrated stadiometer. The subject stood barefoot, feet together and heel, buttocks and upper part of the back touching the gauge, with the head in the Frankfort plane, not necessarily touching the gauge. The Frankfort plane was considered as the orbital (lower edge of the eye socket) being in the same horizontal plane as the tragion (notch superior to the tragus of the ear). When so aligned the vertex was the highest point on the skull. The measurement was taken to the nearest 0.1 cm at the end of a deep inhalation. Subject's head was held up and the eyes looked directly ahead. The blood analysis was performed by a professional pathology laboratory namely AMPATH (a division of Du Buisson and Partners pathologist). The maximum oxygen uptake (V02 max) was determined through direct/ open circuit spirometry, using a Schiller CS-100 gas analyser and a Quinton motorized treadmill (model 24-72). The gas analyser was calibrated before each test with the appropriate gas mixtures supplied by Air Products. The tests were conducted within an air-conditioned laboratory at a temperature of 20°C and barometric pressure of more or less 655 mmHg. 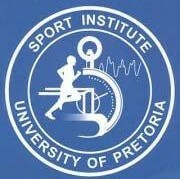 The treadmill protocol started at a running speed of 8km/h and the elevation remained constant at 2% throughout the test. The speed was increased every two minutes until a running speed of 16km/h was reached. After this point, the treadmill speed was increased with 1 km/h every two minutes until exhaustion. The athletes were verbally encouraged and the tests were terminated when the athletes could not maintain the running speed.